Taylor Swift has proven herself to be the biggest name in pop, and the most generous. Currently in the midst of a world tour for her 1989 album, Taylor is still finding time to have fun with her friends, her new boyfriend Calvin Harris, and helping fans in need. Here’s everything that’s going on with Taylor right now. As you may already know, Taylor basically changed the music industry a few weeks ago when she took on Apple and called them out for not paying artists for their new streaming service, Apple Music. Taylor wrote them an open letter explaining how this was unfair to up and coming artists. Almost immediately after this letter was written, Apple announced they would begin paying artists for their music, even during the free trial. Go Taylor for looking out for fellow musicians. 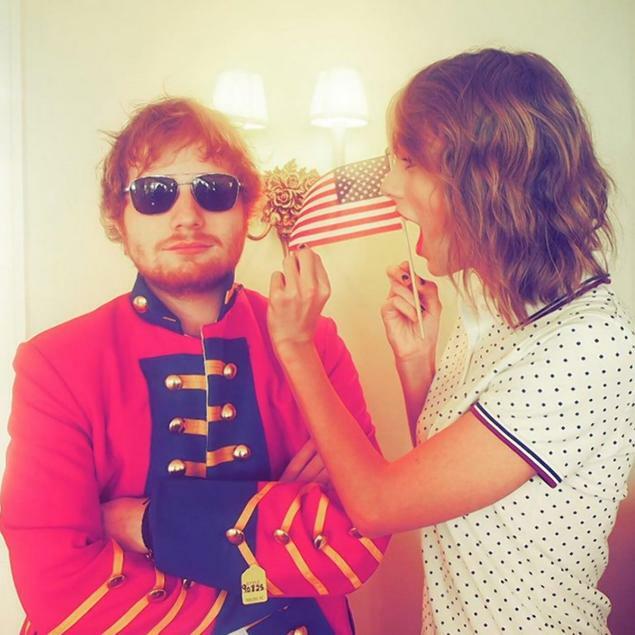 Taylor and Ed Sheeran messing around on July Fourth. Next, Taylor had what looks to be a pretty epic July Fourth weekend. She kept fans updated on instagram, posting pictures of her and her many friends having a pool party and doing some baking. She also uploaded an adorable picture of her and her boyfriend Calvin Harris hanging out by the pool. This picture got about 2 million likes on instagram, so it’s safe to say people are a fan of this new couple. Taylor also spent some time with her brother. Brit Ed Sheeran “crashed” her independence day party wearing a revolutionary war style redcoat, jokingly supporting his home country. Her party sure looked like a blast and we would’ve died to be invited. Taylor getting cozy with Calvin Harris. Lastly, Taylor has done some really good things lately for her fans. One fan missed a concert because of a cancelled flight. Heartbroken, she tweeted about her travel nightmare and Taylor saw and offered her free tickets to her next concert! She also recently randomly gave a fan fashion advice about his upcoming prom. And more majorly, Taylor donated $50,000 to an 11 year-old girl who is battling leukemia. The fan wanted to attend Taylor’s tour, but was too sick to make it. Taylor gave her the money and a heartwarming note, sending her prayers and promising the concert when she gets better. The girl was so shocked and touched she was speechless. What did you think of Taylor’s amazing July Fourth weekend? And how insanely generous is she?! Let us know in the comments or tweet us using #glamorouspaper!